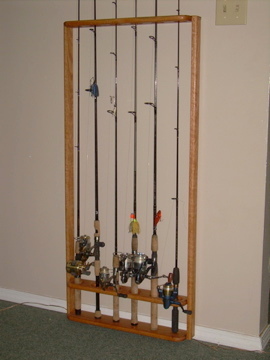 This display rack will hold six rods of varying lengths. It measures four feet tall and two feet across. It has two wall hooks on the back for hanging on a wall. Like all my products, this one has been built very sturdy with extra attention given to a beautiful finish on the red oak. The rack in the picture has a golden pecan finish, although other colors are available. Racks with more or less rod capacities can also be made.